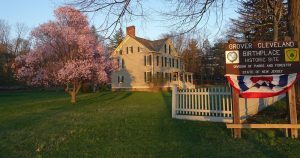 The Grover Cleveland Birthplace Memorial Association (GCBMA) is a conservancy and advocacy group dedicated to preserving the home and legacy of President Cleveland, the only U.S. President born in New Jersey. Through volunteer-based initiatives, our goal is to increase awareness and support of the Grover Cleveland birthplace and its heritage. The GCBMA activities include support of educational programs and lectures, interpretation and preservation of the birthplace and its collection of historic objects, and history-themed social activities which engage the public. Working in partnership with the State of New Jersey, we look forward to approval of our plan to build a Visitor Center which will provide space for educational and programming activities, as well as to display historically significant artifacts and exhibitions related to Grover Cleveland and his Presidency.